Only Props 7 is a DVD featuring the mighty Martin Mars WWII flying boat, old propliners such as the C-54/DC-4 and DC-6, Beavers, the Grumman Albatross, Caribous, and very rare footage of the ATL-98 Carvair. See the gigantic Martin Mars WWII flying boat. The first prototype was delivered to the U.S. Navy in June 1945 (model JRM) and was slated for use as a transport aircraft. But after the end of the war just two months later, the Navy reduced its original order of twenty JRMs down to five. These five aircraft were used by the U.S. Navy for ferrying cargo on the San Francisco to Honolulu route until 1956 when they were retired. 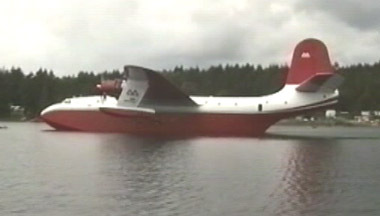 At this time, the four remaining flying boats were purchased by a consortium of Canadian timber companies in British Columbia and converted to water bombers for use in fighting forest fires. Currently, the last two remaining aircraft (Hawaii Mars and Philippine Mars) are continuing their water bomber roles in BC, Canada. Included on this DVD are close-ups of the Hawaii Mars at anchor as well as views of the interior including the cockpit. Truly a treat for the flying boat fan! Also notable on this DVD is a flight in a C-54/DC-4 from Fairbanks to Chungnak, high above the Arctic Circle. This footage was filmed in 1999 in Canada, Alaska, Oklahoma, Georgia, and Florida. The DVD is in NTSC format. Run time is about 60 minutes in color without any narration.